While many still talk about the inevitable death of newspapers – the enduring success of one title proves that readers, and even millennials, still love print. Launched in 1999, Metro is now the most read newspaper in the UK in terms of monthly reach (according to the National Readership Survey) with 10.4m readers a month in 2016. 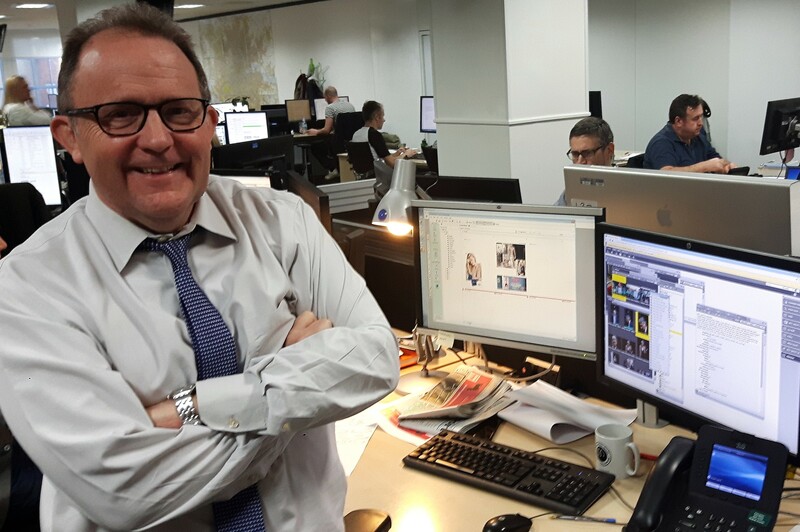 While paid-for national newspapers are in near universal decline, Metro continues to raise its free distribution – up 9.5 per cent year on year to 1.5m copies per day in February. It looks to be only a matter of months before it overtakes The Sun (currently on 1.6m) to become the UK national newspaper with the highest daily print run. Published by Daily Mail owner DMGT, Metro is distributed on weekdays via pick-up points at major train, bus, Tube and tram stations in major cities around the UK. Metro editor since 2014, Ted Young has his own theory about this print title’s ongoing success. “Obviously it’s free and my kids, who are in their mid twenties, would never consider buying their news. “I’m a commuter and I think if you go on a tube or train you will see Metro being read more than any other newspaper on a morning. “My theory is that a lot of people now spend eight or nine hours a day sitting in front of a screen, there is something about print and the newspaper which is giving them a screen break. “No need to scroll, no need to download, I don’t think there is anything more mobile than a newspaper. The digital edition, a facsimile of the print title designed to be read on tablets, has an average daily readership of just over 30,000 and provides Young with daily feedback on exactly which articles are being read and for how long. The average time spent with the digital edition is 27 minutes. Young estimates that print readers average 20 minutes, a level of engagement which is unheard of for news websites. He says: “We essentially are a news aggregator, we are never going to win a Pulitzer prize. We don’t break great exclusives. “What we do do is provide the working man and woman with all the basic information they need so that when they are at work at the water cooler they can have a chat about what is going on in politics, the world and showbiz. That is my mantra. 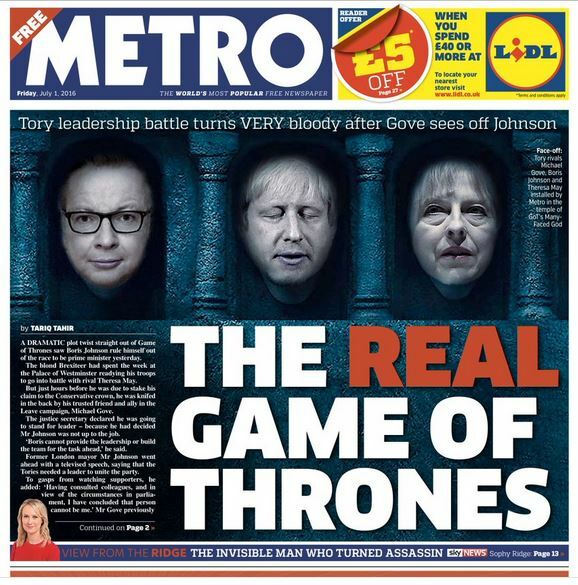 But can Metro survive the current severe pressure on print advertising? Last year DMGT reported that profit at the title dropped by £1m to £15m on turnover down £5m to £65m. He adds: “One of the misconceptions about Metro is that because it’s free, people just pick it up. “It’s not easy to get people to pick up a newspaper. We are putting out nearly 1.5m copies a day…Our returns are about t 1.3 per cent nationally, the number left in the racks, it’s a phenomenal achievement. “I was at Heathrow airport a couple of Saturdays back and there were huge stacks of the Financial Times which cost £3.50 that nobody wanted to pick up. That rather proves that just putting a newspaper out for people to pick up doesn’t mean they will pick it up. 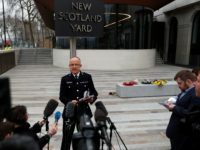 Young is a former editor of short-lived free London title London Lite and Mail Online and has also worked as a senior journalist on The Sun and Express titles. 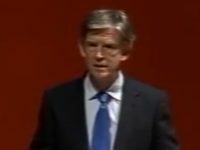 In September 2004 he was executive editor of the Daily Express on the day of the Beslan School siege in North Ossetia, where at least 385 people would die. Proprietor Richard Desmond jabbed Young in the stomach because an obituary of 1960s pop singer Carl Wayne, from The Move, had appeared in the Daily Mail but not the Daily Express that day. Young can’t talk about the episode, except to stay that three friends supported him while he was out of work so that he could sue Desmond and secure a reported six-figure payout. Metro has a total editorial staff of around 60, tiny by national newspaper standards. And while it can’t compete on scoops, it does give the other tabloids a run for their money in terms of eye-catching front pages. 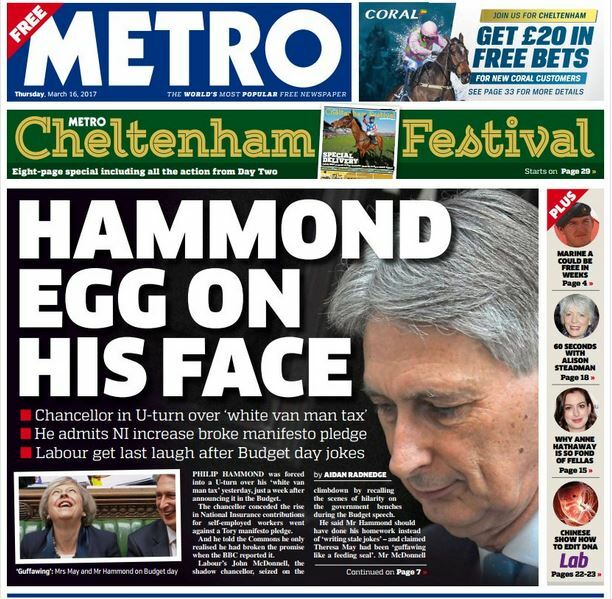 More recently there was: “Hammond Egg on his face”, the day after the Chancellor’s u-turn on a tax rise for the self-employed. 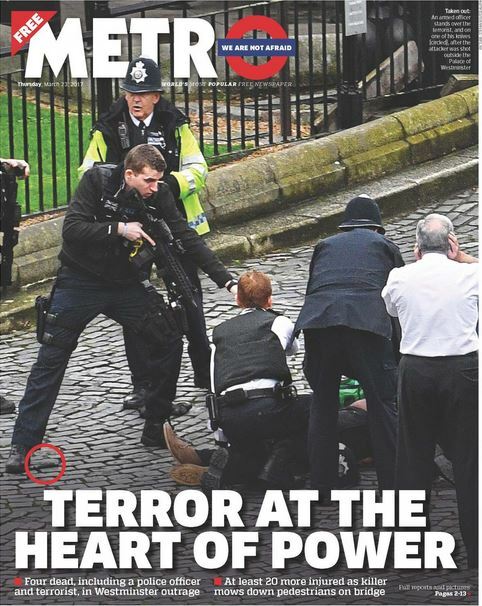 And this week, after the terror attack on Westminster, the Metro’s poster-style “Terror at the heart of power” front page was among the most powerful of the day. 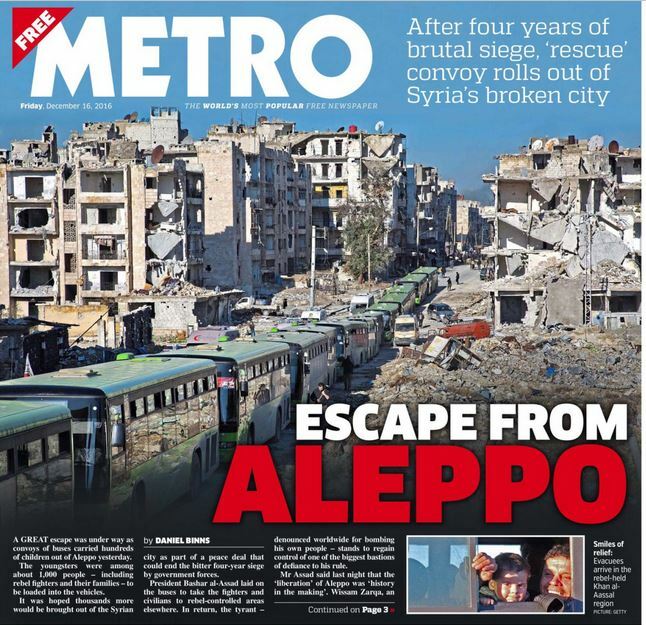 Young also notes that Metro was the only tabloid to carry the evacuation at the end of the siege of Aleppo on its front page. 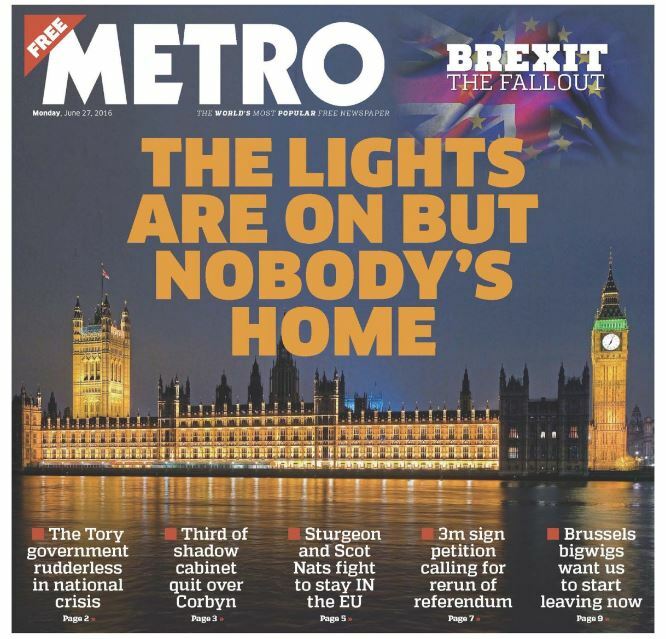 Along with the i, Metro is the only UK national newspaper to take a neutral political stance. In the run-up to the EU referendum, Young says the Leave campaign wanted to take out a cover-wrap advert (worth £250,000). He says he said the only way the paper could do it was if Remain took out an advert as well. As it turned out, they did, meaning Metro made £500,000. He says that after each the paper received around 300 texts and emails of complaint from readers. “We don’t want to upset our readers. The reason we are even handed is because we are a very broad church, I think we are a one-nation newspaper. When you are buying the Daily Mail or Daily Mirror you making a conscious decision to buy that product because you believe in what that newspaper’s stance is. Metro research suggests the average age of its readers is 37 (which is said to be 22 years younger than the average weekday newspaper reader overall). Some 1.4m are said to be aged 18 to 24. Given the rate of decline in the paid-for press, could there become a time when free titles like Metro are the only show in town? I read the Metro when I collect it from the local tram stop in Manchester, but if I don’t find one I don’t really miss it. Too much celebrity trivia, but I like the Sudoku puzzles. It’s a pity it doesn’t have the Nemi cartoons any more. Disappointing comment about Metro reporters at press conferences there Andy. I know that I’ve asked questions at the Open Championship and big snooker events for starters. Also, I know for sure that one former colleague asked many questions at big cricket press conferences. I saw him ask them on television. As for ‘half-hearted coverage’ that’s pure nonsense I’m afraid. Did you see Metro during the recent Cheltenham Festival? We had one supplement of 12 pages, and three more of eight pages. I’m not sure any other British national newspaper came close to that level of coverage. We always cover late midweek football – if there’s extra-time and penalties we will tell the story of the match in second or third editions. During my time at Metro I’ve covered (live) The Open, the US Open golf, Ryder Cup (including 2016 in America), French Open tennis, Cheltenham, the Super Bowl, snooker’s World Championship, the FA Cup final and League Cup final. While at these events, I’ve conducted many exclusive interviews, written a number of colour pieces and always done daily diaries. One of my colleagues travelled round France last year to cover Euro 2016, while another was in Rio for the Olympic Games. Not a bad show is it?